Seriously…who would have thought something as simple as going to the store and picking up a box of Zyrtec-D would be so difficult. For the past two weeks my allergies have been giving me the blues, sneezing like crazy, itchy/watery eyes, headaches, the whole nine. I’m one of those “take an allergy pill everyday” type of people. So the days when I can get away with not taking one are very few and far between. The day I took my last pill was no different from any other time that’s happened where I would just politely take myself to the store and buy another box. Little did I know that things were about to change. For the first few days, I searched high and low for a pharmacy that had it in stock. I’m talking Walgreen’s, Kroger, random pharmacy shops, Savannah, TN Walmart, Florence, AL Walmart and then finally the Jackson, TN Walmart…what did I find? Absolutely nothing. After realizing that it was not just a coincidence that every store was out, I figured that something must be going on. That’s when I learned the horrible news that I needed a prescription to get my hands on the goods…ugh! Frustrated because I didn’t have a regular doctor down here yet (seeing how it had only been a couple weeks since the move), I had to go with plan B. Luckily my honey was able to point me in the right direction and I was able to get an appointment for the new week, which is actually pretty good considering the usual wait time for a new patient appointment. In the meantime, I was stuck with plan B (Allegra-D) and let me just say that it does not work the same! Not at all. Which brings me to today…yeah I know it took me a minute to get to the point but whatever. My appointment was scheduled for 9:40am, which is probably the earliest I’ve had to be anywhere in a very long time. I left the house at 9:35am and still made it through the door of the doctor’s office on time. That’s one perk of a small town, everything is close. I sat in that raggedy office with a lackluster cell phone signal for over 2 hours, yes…2 of them. Good news is, I’m healthy. Bad news, I still have the allergies that I wasted time trying to describe to the doctor because of course she had to find them out for herself. She also thought it would be good to write me a script for a nose spray and a couple other pills that I should try. Thanks but no thanks lady, I only wanted the Zyrtec-D.
For real for real, the generic version? Is this a joke? I went through all of that for the Equate brand! I was not a happy camper. And before you start thinking that I’m above taking the generic brand, I’ll be the first to say that I’m not. 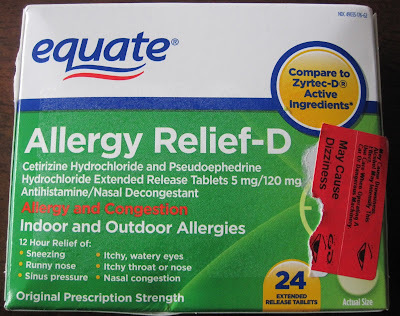 But when it comes to my allergies, I don’t like taking chances…especially when I’m used to getting the regular brand from any given pharmacy back home. Call me crazy, but for some reason seeing that box definitely didn’t give me the satisfaction I was going for. Previous Post Who Is Gabe Flowers? ?